If you are a municipality or business owner looking to make your winter snow removal and maintenance tasks a lot easier, look down at your asphalt surfaces now, rather than up at the changing season skies. Taking the time to asses the condition of your parking lot, roads and walkways will allow you to create a preventative maintenance plan. Putting this plan into action with the help of your municipal asphalt paving contractors will make your life easier this winter, and provide cost savings for years to come. 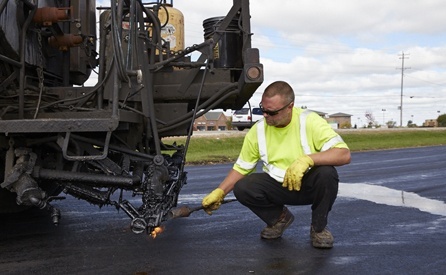 To help you get started, here are three resources that explain how end-of-season asphalt repairs can save your municipality money. Interested in learning more about how Wolf Paving can help you? With 75 years of asphalt paving experience, from highways to driveways, we are your local source for all of your fall repairs and Milwaukee asphalt paving needs. For more information on Wolf Paving or to request a free quote for your next paving project contact one of our two offices. If you live or work in the Milwaukee area, call us at 262-965-2121. For Madison asphalt paving help, call us at 608-249-7931.